John Hughes concedes that Inverness Caledonian Thistle face a significant challenge in the defence of the Scottish Cup against Hibernian. Sunday's hosts have a track record of defeating Premiership sides in cup competition this season. Hughes is clear that the Championship side are of top-tier standard. "You just need to look at our last result against Hearts," he said. "Who knocked Hearts out of the Scottish Cup? Hibs." Hibs are not only challenging for promotion but have already reached a national final this season. "You just need to look at the teams Hibs have knocked out to get to the League Cup final - Aberdeen, Dundee United, St Johnstone," said Hughes. "They've been taking Premier League scalps along the way. We're well aware of that and we give them all the respect. "We need to make sure we're at it and switched on." Hibs' recent record makes poor viewing with three league defeats on the bounce seemingly ending their Championship title hopes. "I don't think that has any significance to what will happen on Sunday," said Hughes. "It's a one-off it's a cup tie. We have to be inspired by the venue. 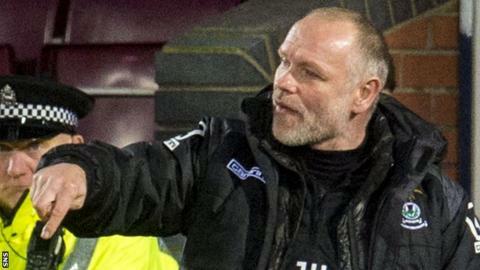 "All the support is going to be for Hibs; that puts a little bit of pressure on them. "The history of the Scottish Cup puts a little bit of pressure on them. Expectations of supporters puts a little bit of pressure on them. "Our pressure is we're the holders of the Scottish Cup. "If we can win that game and get into the semi-final of the Scottish Cup, it could galvanise us for the remainder of the season. That's how important it is, but you don't put too much emphasis on it." Hughes also affirmed his belief that the quality of sides currently in the Championship means an expanded top division should be explored. "I feel for Hibs as it looks like they're going to be in the play-offs", he opined. "Scottish football has missed Hibernian. "You cannot have your top supported clubs playing their football in the First Division. "You get relegated, you have to take your medicine, but I'm massive for a bigger league. We have to look at the bigger league."